Article taken from Good Old Boat magazine: Volume 1, Number 3, November/December 1998. Viewed from the bow, the photo above right shows the starboard vang released and the port vang trimmed. Photo at bottom shows the control lines led to the helm station. Notice the double-ended line. I was guilty of contempt. Never a good thing, in this case it turned out to be a serious error. I had held a thunderstorm cell in contempt all morning. It was over there, and we were over here. We had been sailing for hours in strong winds that were probably feeding that cell, but it had been such a joyful ride I couldn't bring myself to quit. We had the 110 up with two reefs in the main and were on a screaming reach. We had been flying like this for hours. Occasionally we would have to tie a foot reef in the jib and put in or shake out another reef in the main. But we were moving. Madeline Island was to windward, and the seas hadn't much fetch. But the wind was getting over the island, and we had plenty of it. At the bottom of the island we headed up but kept our speed. Eventually we breasted the red nun that marks the shoal, tacked, and fell off on another screaming reach. Karen is the smarter of the two of us. I don't deny that. She suggested that perhaps the storm cell was moving toward us and we should probably shorten sail. I delayed. Each gust seemed to offer a chance to explore new territory on the knotmeter. It was intoxicating. Finally Karen said we should at least get our foul weather gear on. She went below first, perhaps to set a good example. Then I went below to dress for the rain that I had to admit was looking more likely. In the middle of my costume change she said, "You've got about a minute." That call was probably accurate to within 10 seconds. I don't know why I don't listen to my wife more carefully. The squall hit. We were deeply reefed but not deeply enough. The wind came from dead astern at maybe 60 knots. I looked out through the companionway and saw that Karen was doing all she could do and doing it exactly right. She was steering dead downwind, not letting Mystic jibe or broach. With that course and speed Mystic would be a monument in downtown LaPointe on Madeline Island in about five minutes, but I didn't think we would make it that far. Mystic's beautiful spoon bow was being pushed down hard by the wind. She was clearly outside the envelope. I popped out of the hatch without bothering to replace the lifejacket I had removed in order to put on my slicker. We always wear our lifejackets, but just when I needed mine the most, there was no time to put it back on. Photo at top above shows the control line and cleat and the caribiner that eases the release and prevents premature recleating. Photo at bottom shows how a flick of the wrist sets up the vang/preventer. I crawled to the mast and cast off the main and jib halyards. Fortunately, they didn't tangle or catch; the beautifully simple jib hanks and mainsail lugs did what they were supposed to do, and the press came off our spunky little Mystic before she could pitchpole or broach. Bare poles were just right for good speed and control. My arrogance would be forgiven - this time. As I look back on it, several factors combined to limit that experience to a good scare and a lesson survived. The person who designed our C&C 30 knew his business; my beautiful wife used great skill in steering without broaching or jibing; the hanks and lugs ran free and fast; and the vang/preventer did exactly what we had intended it to do. Vang/preventer? We knew of no existing term for this rigging, and we had to call it something. On Mystic, the vang/preventer is a pair of 4:1 tackles leading from mid-boom to the port and starboard toerails just abaft the stays. 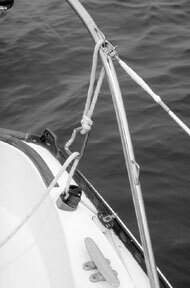 A single control line runs from both tackles aft through fairleads and cam cleats port and starboard of the helm. Because there is only a single line, as the boom swings off, line taken by one tackle is given up by the other, so very little excess line clutters the cockpit. A flick of the wrist controls the boom. On Mystic the vang/preventer is actually a better vang, a better preventer, and a better traveler than anything else we could have devised. Mystic had a traveler when we bought her, but it was a simple affair with no control lines. The idea was to lift the detent pin and move the car stop to the new location. The traveler was about two feet long and resided on a beam between the cockpit seats just in front of the wheel. (Shown in photo.) It could not be moved under load and was only useful when beating. It was too short to help on a reach. The previous owner kept the original vang in the starboard lazarette made up like a hangman's noose. After using it for awhile, I was convinced he had the right idea. The people at C&C were not about to give up any sail area that could be easily had, so Mystic's boom sweeps very close to the deckhouse. This leaves the (conventional) vang at a very poor angle when led between mid-boom and the base of the mast. 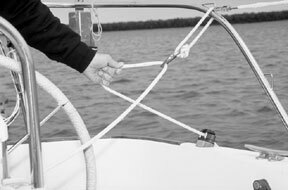 Fortunately, when the boom is close in for beating, the vang is not necessary; the traveler controls the sail twist. It took some getting used to - unloading the main to move the traveler - but we managed and were glad for the lack of cordage the simple thing offered. The real problem was the vang. Adjust the mainsheet and vang(s) to make the trailing edge telltails fly straight back. A: Heavy air beat - Mainsheet controls angle of mainsail and twist. Close reach - Mainsheet controls angle. Trim the leeward vang to remove twist; trim the windward vang to add twist. B: Light and medium air beat - Trim windward vang to bring boom inboard; trim mainsheet to reduce twist. C: Broad reaching and running - Trim leeward vang to set up preventer, hold boom down, hold boom out in light air, and take out twist. We could lead it to the toerail on reaches and runs, but doing so required the crew to scamper about the deckhouse and side decks ... sometimes in darkness or heavy weather or both. A jibe demanded tedious choreography and a minimum of two crew. We wanted better. The night my good friend stuck his head out of the hatch just as an eddy gust from the shore jibed the main, was the last straw. We had been becalmed and so had not set the vang as a preventer to the toerail. It was viewed as a bother in any circumstance and certainly was not deemed necessary when there was no wind. The blow of the boom could have killed him. 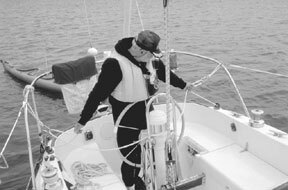 He recovered and finished the cruise, piloting us skillfully through the Apostle Islands in a late October storm with near-zero visibility. We didn't have radar then or even GPS; we had Steve, the beginning sailor but experienced aviator, and that jibe had nearly eliminated him. I wanted a way to set up a preventer in a second - something that did not need to be removed from the toerail in a jibe. Our vang/preventer was the answer. The first version was 3:1 and used horn cleats. It was good, but not good enough. At 4:1, we could get good downward force on the boom no matter what position it was in. The bonus was that the preventer was now a good sail trim control. The purpose of a traveler and vang is to allow good mainsail leech control. By moving a traveler to windward on a beat in light air, the main can be given the twist necessary for good performance. As the breeze picks up, the traveler is let down in stages to leeward which, in combination with increasing mainsheet trim, will give progressively less twist. In a blow just before a reef is put in, the traveler is let down all the way to leeward, and the main will luff a little near the mast and reduce heel. As the wind goes aft, the vang takes over the job of pulling the boom down to control twist. If the boom is mounted high enough, the vang can lead to the base of the mast. But in the best of circumstances, the stresses are high on the vang, boom, and mast because the angles do not favor the task. With our vang/preventer we have a better traveler than if we had an elaborate track, car, and tackles like a racer. In light air if we want to add twist, we trim the windward vang. The boom lifts just as it would with a fancy traveler. As the air picks up, we ease the windward vang and add some mainsheet trim. When we are a little overpowered, we trim the leeward vang, and the main untwists and luffs a little along the mast. When we bear off, we ease the main and trim the leeward vang a little more to keep the twist from getting excessive. A few telltales on the main make it easy to see what must be done. As we steer farther to leeward, the main is eased and the vang taken up. The preventer goes on automatically in the course of getting good trim, so it is there when we need it. A jibe is a joy with this rig. There is enough friction from the vang/preventer to keep a flying jibe from being very fast, even if we just let it all go. We don't do that, of course. We ease the vang and trim the main until it pops over, then we let out the main and set up the new vang - all very easy, fast, and smooth. It is also very safe; no one leaves the cockpit. On light wind days we used to have trouble keeping the boom out on a run because the weight of the mainsheet was enough to cause it to swing back in. With a vang/preventer we just trim the boom out to where we want it, and it stays there. The vang/preventer is a good singlehanding rig also. 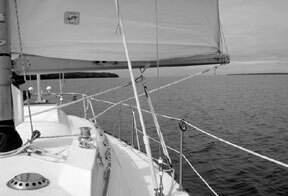 I sailed Mystic alone for a couple of weeks last summer in winds up to 35 knots as cold fronts pushed through the Apostle Islands near our home port. The vang/preventer was handy for this, since all the control lines, mainsheet, jib sheets, and both vangs were within easy reach of the helmsperson. Would we have jibed in that thunderstorm without the vang/preventer? Other boats did. Would I have had the courage to go to the base of the mast knowing that the boom was free to jibe and wipe me off the deck? I think it made a difference. Next time I'll listen to Karen.